Sendang Biru Beach Malang approximately 70 km south of the city center towards the beach Malang.Untuk blue spring you have to pass Turen, then head towards Sumber manjing Wetan. Well here's district Sumber Manjing Wetan coastal areas lies the Sendang Biru. Sendang Biru is better known as a fish landing and auction Malang regency, but also opened as a tourist. If you did not know the location, please ask directions Turen first if still in the city of Malang, until after Turen then simply ask Sendang Biru location. Residents around Turen average all already know the direction and the path to the beach. The surf beach is quieter than the spring blue waves Balekambang Beach or Beach Ngliyep although equally as dealing with the ocean beach Indonesia. Because hindered by existing Sempu island opposite the beach. Distance of the two only separated by a narrow strait. Because of this condition the Sendang Biru is very suitable for boating, fishing or other water sports beach. Sempu island itself is also much visited by tourists who like the outdoors. In this Sempu Island there are also small freshwater lake inhabited by many fish. In addition, the island is a habitat for all sorts sempu fauna, especially birds consisting of innumerable species. If you want to cross over to the island or just Sempu puter-puter from left to right you can catch a boat Island which was prepared by the locals to tourists. Tariff if one boat chartered own one group klo weekdays IDR 75K, but klo refractive holidays up to IDR 100K. Or you can around the island with more expensive fare around IDR 300K. 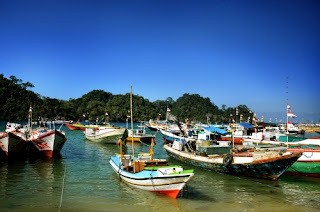 On 7 or 8 Shawwal, many people who take a boat to Pulau Sempu to take fresh water is in the lake there. According to belief, freshwater Sempu Island efficacious for health or healing. To come times to locations Sendang Biru Beach can be reached by all types of cars and motorbikes. The nearby beach with this Sendang Biru Coast sardines, white sandy beaches sloping unspoiled. Second distance is about 3 km's.